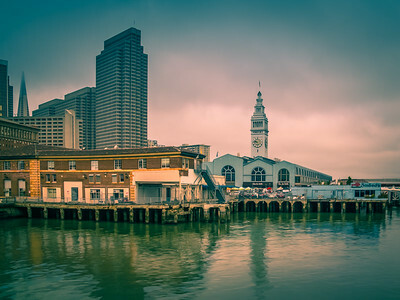 ​After completing the development of Lightroom Rapid Editing PLUS for Cityscapes I would like to share with you the workflow I use with the new editing approach. In my original post, I revealed the concept of a new editing approach where I found the way to emulate or hack the opacity functionality that does not currently exist in Lightroom. After successfully testing the new "opacity" functionality and being happy with the results, I started testing different workflow approaches to find the most effective way to edit photos in Lightroom using the Rapid Editing Plus approach. First, for each preset in the Cityscapes Collection, I created 6 additional versions by generating different opacity versions in 10% increments. I started with 40% because the versions where the opacity range was between 10% and 30% were too subtle to see any effects and produced totally useless results. I strongly believe that photographers who use Lightroom Cityscape Preset Collection will profit the most from Rapid Editing PLUS workflow. When you edit cityscapes, you can be as aggressive as you want whether that involves changing colors and tones, enhancing the contrast or experimenting with unusual color combinations. The reason for this is because there is no reference point for the person, the viewer, looking at your picture. 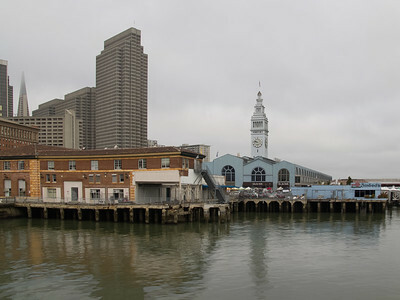 In most cases, the viewer does not know what the color of the building actually is, which allows you to freely manipulate it. I find that aggressive editing of Cityscape Collection works the best when you edit architectural shots. But when you start mixing cityscapes with the other types of photography in some cases they produce the effect which is too strong. For example, if you introduce elements of landscape photography such as an open sky with the dramatic clouds into your cityscape composition, the presets can produce an unnatural result. 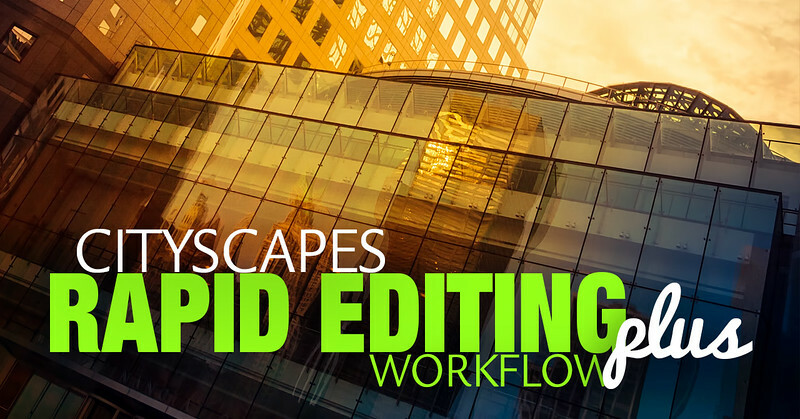 The ability to dial down the effect of Cityscape Presets becomes extremely valuable in such cases, giving us more choices and extra flexibility. To get started with the new approach, here’s my proposed outline for the Rapid Editing Plus workflow. For the demonstration of the proposed workflow, I purposely selected the photo I took in San Francisco on an overcast morning with a dull and wide open cloudy sky. This is when Cityscape Presets work the best. I use them often to revive "flat" and colorless compositions. At the same time, I make sure I do not go overboard with editing and produce "overcooked" sky. Select the image and evaluate the exposure value. 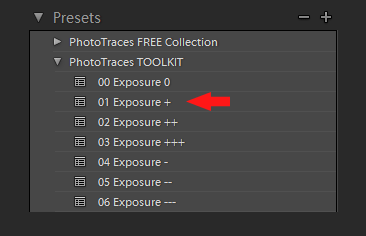 If it needs any adjustment, use the TOOLKIT or the Lightroom Exposure slider in the Basic Panel to set the exposure value to achieve the desired result. 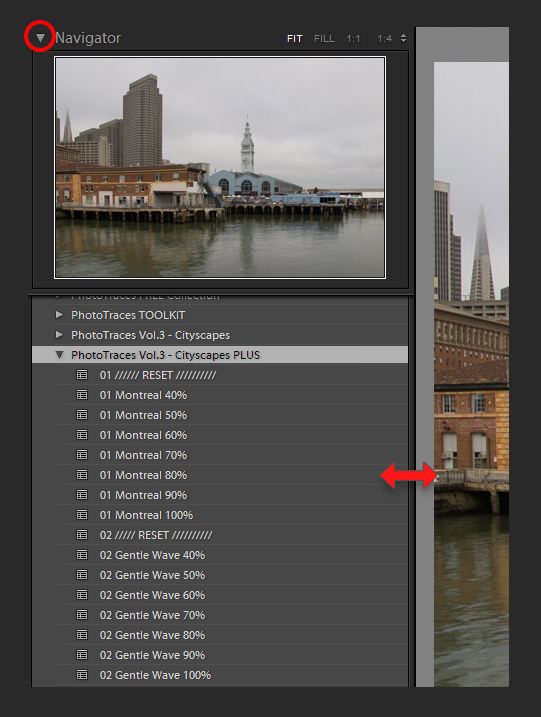 Open the preset folder PhotoTraces Vol.3 - Cityscapes PLUS and start applying the presets to the selected photo. The goal here is to find an interesting look, something you can improve upon later. I suggest starting with the 100% versions because that is how it was intended to work when the effect was first created. In my case, I liked the look Boston preset produced but​ the effect was too strong. Open the Navigator window above the Presets panel if it is not already open. Drag the Lightroom left panel boundary all the way to the right, making it as wide as possible. The goal is to have the biggest possible preview in the Navigator panel. 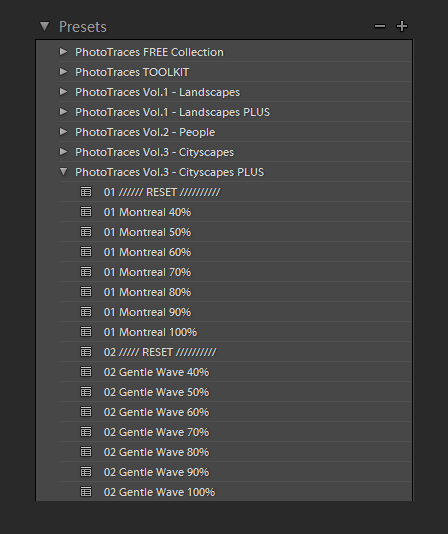 Move the mouse over the Boston preset versions with the various opacity values without clicking on them. By doing this, you can see a real-time preview of the effects in the Navigator window, which will help you identify the editing effect you like the most. When you see the version you like the best, click on it to apply the effect on the main image. I also used Filter Brush functionality of Lightroom to remove the effect of Graduated Filters from top of the buildings (check How to Use Filter Brush in Lightroom). I created four more versions of the same capture using Rapid Editing PLUS Workflow I outlined earlier. Under each final photo you can find the Lightroom Rapid Editing formula. I regularly use Lightroom Rapid Editing PLUS for Landscapes. It allows me to fine tune the effects I like. 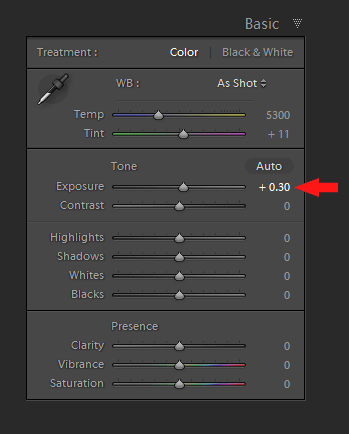 I also use the cityscape presets,and it would be great to have the control over opacity for them! I will be sending the PLUS version to all customers tomorrow or days after. I regularly use (my modified version of your) PhotoTraces Toolkit (based on our last email discussion). I don’t remember getting your Cityscapes presets – I did buy the Landscapes version (along with Cross-Processed). OK…I just found them. Can you please forward the Opacity tool? Thanks.